Real IPM directors of Kenya and UK (pictured) joined in the celebrations of parent company Biobest and its 30th anniversary in Belgium earlier this month. They discussed development of product registration within the EU and steps to extend Real IPM reach to the wider market. Joining Biobest is bringing a real boost to bringing Real IPM to European farming. Real IPM UK is growing its profile across the continent by now being a subsidiary of this fast growing business . Biobest has benefited from the deal. It is gaining access to local infrastructure to produce biopesticides in Kenya, as well access to eastern and southern African citrus and field crop growers. 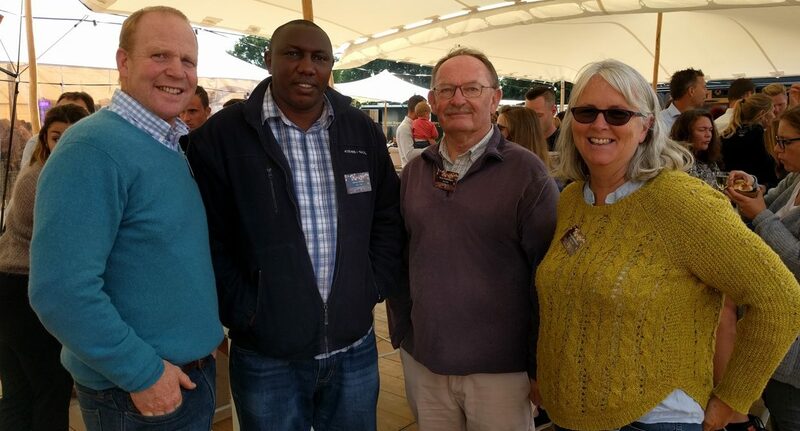 From left: Antony Pearce Director, Real IPM UK; Samuel Ngugi Assistant GM, Real IPM Kenya; Henry Wainwright and Louise Labuschagne, Real IPM Kenya. Antony Pearce, director of Real IPM UK, hopes Biobest will provide growers with the premier knowledge transfer programme to enable them to optimise biological control results. Earlier in the summer the Biobest business announced its expansion into Central America with the acquisition of the Mexican distributor of environmentally solutions for plant health and pollination, Distributions IMEX. Under canvas under European and Belgian skies rather than African ones, the 30th anniversary party was an opportunity for many who believe in Real IPM to celebrate the continued expansion of the Biobest group into another continent. And to look forward to the next thirty years bringing integrated pest control solutions to farmers worldwide.